It’s Treat Tuesday! And this week’s treat is all about deworming chickens naturally with herbs! WormBGone Nesting Herbs Are IN! YES, I Want WORMBGONE Nesting Herbs! Now, I’m the first to say that there haven’t been too many studies about herbal dewormers themselves, particularly for chickens, ducks, geese, and the like. Back in the day, people HAD to rely on herbs and natural resources to keep their flocks healthy. It’s only in modern times that we’ve been able to rely on pharmaceuticals to get rid of internal parasites. But even with all the modern resources we have, there hasn’t been an overwhelming amount of studies to reveal which pharmaceutical wormers work, and there’s even less reliable products in the market. (There really aren’t any, to be precise). A big reason for this is the broiler industry doesn’t need to worry about worms too much – the chickens are kept indoors and don’t live long enough for parasites to develop. The egg industry keeps hens off of the ground – for the most part – and while there are a ton of health issues hens can pick up because of the egg industry, worms aren’t usually one of them. There’s also the problem that pharmaceutical dewormers have withdrawal periods – and who wants a mouthful of drugs? Not me! So, as chicken keepers, it’s kept us a bit in the dark and we need to rely on anecdotal evidence as well as the few studies about herbal dewormers available to keep our hens healthy. That being said, there’s a long history of certain herbs “doing the trick” to expel parasites from chickens, and today’s treat includes the best of the best! Capsaicin in chili pepper, in particular, has been shown in some studies to cause worms to detach from a chicken’s intestinal tract, causing them to be expelled through the vent. It interrupts the worm’s life cycle, making your hens healthier. In one study, hens fed red pepper also laid healthier, bigger eggs, AND had more golden yolks! If you’re worried your hens won’t eat spicy herbs, you don’t need to worry – chickens have far fewer taste buds than people. Another traditional herb used to deworm livestock is wormwood – in fact, it’s been used since ancient times to rid both people and animals of internal parasites. In one study done on broiler chickens infected with coccidiosis, the chickens who ate wormwood were healthier and had gained weight by the end of the study. A second study also had similar results. So, as you can imagine, the combination of red pepper and wormwood is a powerhouse! Sage is another herb that has shown to have some properties to help rid chickens of internal parasites, so it’s also included in this herbal mix. 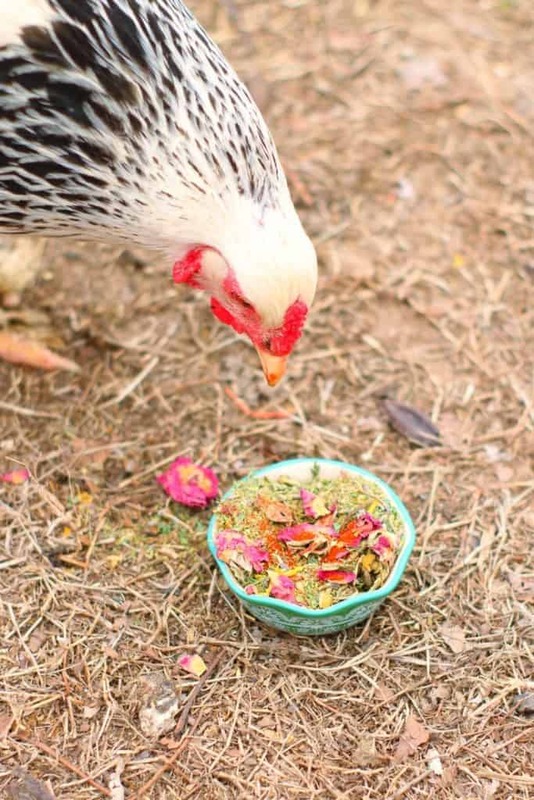 So, it’s important to also provide your flock with herbs that can help them repair their bodies and that have a lot of vitamins and other nutrients. 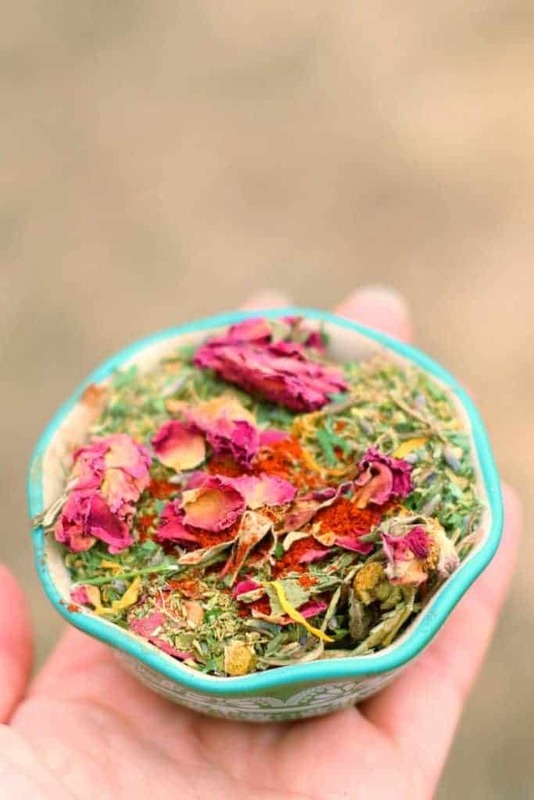 My hens love this herbal mix, and I know yours will too! 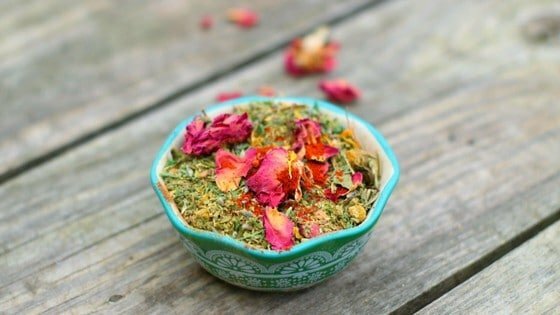 If you’re ready to make my flock’s favorite Herbal Deworming Mix, then here’s the recipe! Combine each ingredients in a bowl and serve to your chickens separately, or include in their daily feed. This recipe should be fed as part of a balanced diet, and not in place of a good layer or grower feed. I live in Canada we can’t get wormwood here it is a restricted toxic plant. We can’t even get seeds to grow it. So very doubtful we could get it through the mail. Are there alternatives to wormwood? Sage and the chili powder are also great, the chili powder particularly. Yes! You can give it to ducks. I’ll start doing more duck articles! Thanks for the compliment!